Smart home technology is one of the biggest trends of 2018. Now, high-tech devices are making household duties easier than ever. Robots clean our floors so we don’t have to, lights dim and brighten according to schedules we set, and appliances switch on and off automatically. As well as making our homes more comfortable and convenient to live in, these devices also make them much safer. With security cameras and applications, you can keep a watchful eye on your property around the clock. In this post, we’ll give you the top ten home camera apps to use. If you’re looking for a great video security app to keep your home safe, read on. Frontpoint is one of the biggest names in home security, so it’s only right that they have their own dedicated mobile app. This app allows to you arm or disarm your system at the touch of a button. 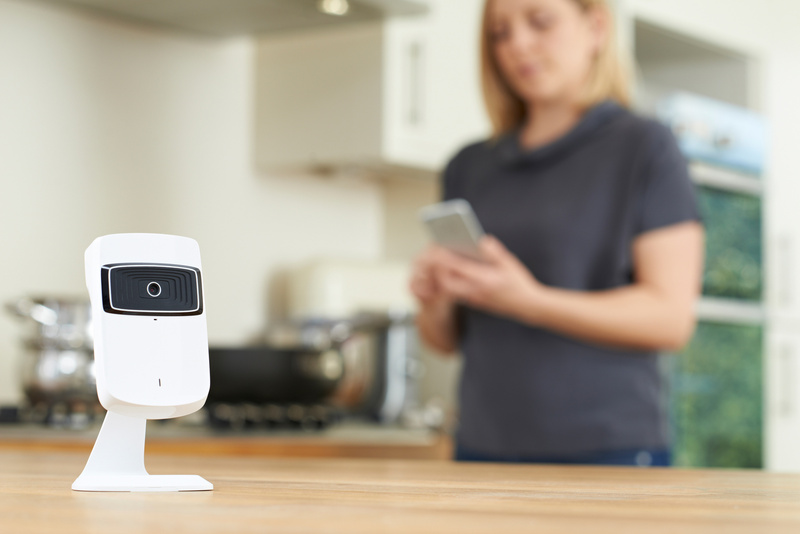 When you want to see what your security cameras see, you can either live stream the feeds to your device or watch recordings played back later on. Frontpoint makes it easy. As long as you have a wifi connection or data plan, you can view and control your home security from any location. The only hitch is that you need to be a customer of theirs to use the app. This application isn’t compatible with security devices made by other providers. The LifeShield mobile application gives you complete control of your home security system. After syncing it up with your various smart home devices, you can link it up to Amazon Alexa. This means you don’t even need to open the app on your phone to control the cameras on your property. When you want to check your home security, turn your lights on and off, adjust your thermostat, or activate your sound system. You can do all of this using voice commands alone. This app is one of the easiest to use since it doesn’t require any configuration at all. Once everything is plugged in and the app is downloaded, you’re good to go. Reolink gives you night vision for a distance of up to 190 feet, so you can always see what’s going on outside your property, even when it’s dark. If your cameras have motion detectors, the app will send you notifications each time they’re triggered. This app can only be linked to home security systems, so it won’t work as an all-around smart home app for your other devices. However, it’s still a great option for your CCTV. If you’re an Android user, this app could be the one for you. You can get a live view display of up to 64 channels, which is more than you’ll ever need. When you want to see them, you don’t have to scroll through lots of different views. Instead, the app displays multiple camera perspectives all on one screen. When you’re watching the feeds, you can take snapshots or zoom in to see more. Xfinity is one of the top cable TV and internet service providers in the USA. On top of that, it’s also the creator of one of the best security camera apps around. Their offering is suitable for both Apple and Android users and works for almost any device. You can access every linked device from one dashboard and receive real-time notifications when anything happens in your home. Smart home technology is still relatively new, and lots of users struggle to figure out how to use it. With Protect America, you don’t have to worry about that. This app is one of the easiest to use. The display is clear, with bold icons and short and simple instructions. The setup process is easy, too. If you don’t want to waste time with lots of trial and error, this is the app for you. This makes it great for technophobes or senior citizens who are used to doing things the old-fashioned way. Do you have any old phones lying around your house? This app allows you to make use of them, turning them into DIY home security cameras! This means you don’t need to buy expensive equipment to keep your home safe. With Alfred, you can do more than just keep a watchful eye on your home. You can also talk through two-way speakers. This enables you to interact with your pet while you’re away, soothe your baby from another room, and talk to visitors before you’ve even opened your front door. Presence works in the same way that Alfred does. Link it up with your old phones or new security cameras. Then, you can use it to either record a constant stream, or only start recording once motion detectors have been triggered. You choose how much is recorded, and it’s all sent to your private cloud storage for whenever you need it. Scout gives you round-the-clock access to your home security cameras, no matter where you are. It also builds alarm systems, so you can be aware of any intruders or potential dangers to your home. This means you don’t have to keep an eye on the app. It will let you know when something’s awry. Until then, you can have peace of mind. Manything gives you live streaming and notifications to alert you of activity in or around your home. It also uses cloud storage, which keeps your security streams for up to 48 hours. We know that your family’s safety is top priority. As well as the best security camera apps, there are other applications that can help you take care of it. Safety isn’t just physical. The online world poses lots of digital dangers, too. Thankfully, online security can help you monitor the online activity of your children, blocking dangerous websites and alerting you of any harmful content. To find out more, see our list of apps parents should use to keep their teens safe.